Thailand is the first country that I repeat. The first time I visited was nine years ago. I thought this time I would only stay a couple of weeks before heading over to Myanmar. I only wanted to experience the Thai New Year (Songkran) and go diving in the islands in the South. Well these two weeks quickly turned into one month. I would have stayed longer if it wasn’t for my visa expiring and the fact that I need to keep moving if I want to see more countries before the money runs out. Happy Songkran (Thai New Year)! 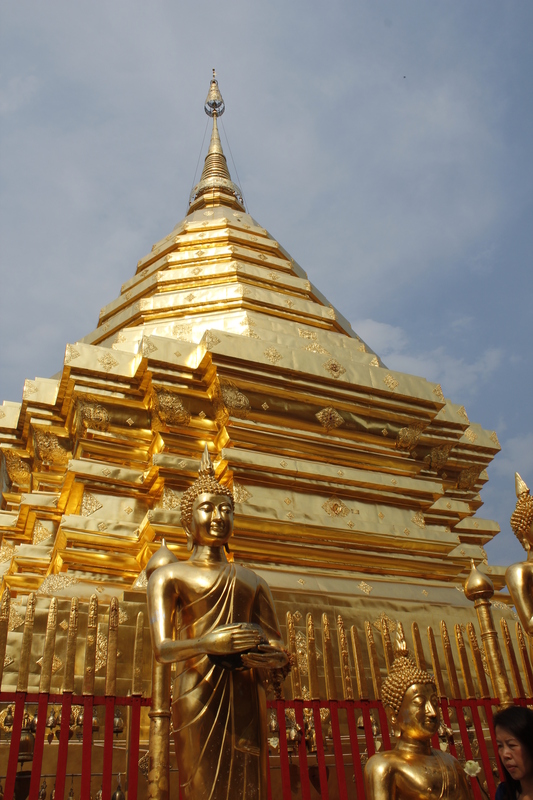 I arrived to Bangkok and took a flight that same night to Chiang Mai to be there right before the Songkran festival; which was scheduled to begin on April 13. Songkran is a word in Sanskrit meaning “to move forward”. This festival represents a new clean beginning for the Thai. It is marked by the solar calendar but nowadays is celebrated in the same date every year, April 13th to the 15th. The tradition for the Thai is to build sand temples, wash the old year away (with water), and welcome in good luck for the new year. Thai families get together during this time; city dwellers go home to their small towns to see their loved ones and to wish good luck and blessings to each other. The tradition is to sprinkle a little water on each other to symbolize the cleansing. Today what you see on the streets is a big party where everyone gets into a water fight. The old part of Chiang Mai is surrounded by moats. There are pick-up trucks that go around the river moats dumping buckets of water (sometimes ice-cold water) to by-passers. In turn they respond by shooting their water guns back. They sell water toys in every corner. I walked around the city on the 12th and was already being shot at by people with water guns. Most of the shooters were tourists though. By the following day on the 13th, the official start of the festival, the Thai had joined in the festivities. Everyone was part of the water fight. I got up early on the 13th and went straight to the Wat Chai Phrakiat to witness the opening ceremony. This is one of the main temples in town; which opens the festival with a ritual of washing the Buddha and parading it around town. I went inside the temple to get my blessing from a monk and immediately after I went to see the crowds outside who were washing the Buddha statue and making offerings to it. 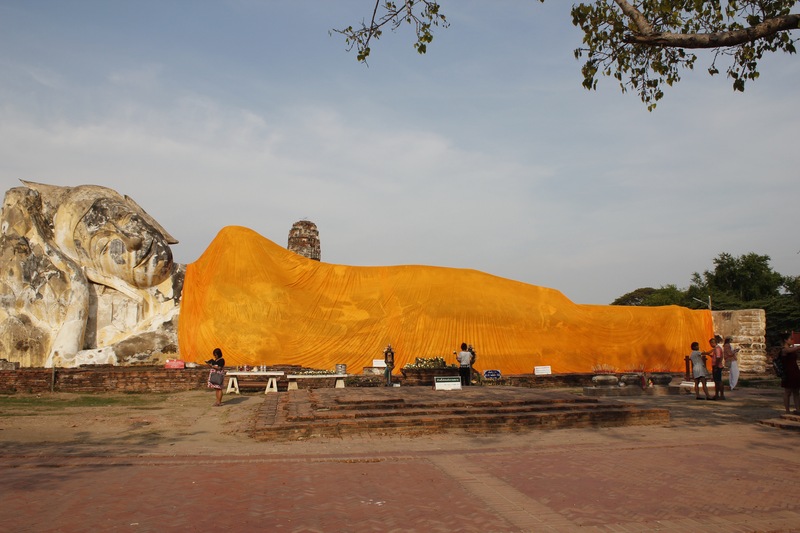 The Buddha was moved to a big pedestal that was tied to ropes; which the people pulled to parade the statue across town. It was a beautiful procession including Thai women dancers, a band, and monks of all ages from the surrounding temples. During the festival no one stays dry. If you are seen walking around in dry clothes, someone will dump a bucket of water on you right away. Only monks, babies and elders get a free pass . You eventually have to get a weapon yourself so that you can get others wet. It is a lot more fun if you take an active role. You see entire families fully armed and all dressed in the traditional flower shirts to celebrate the festival. A lot of families will set up water filling stations around town to offer water to whoever needs it. After 7:00 pm things quiet down and you can actually manage to stay dry to go to dinner. I took my friend Philippa’s recommendation of visiting the Elephant Nature Park. This is an organization that rescues and rehabilitates elephants in Northern Thailand. Anyone can visit and/or volunteer time here. The visits are a bit pricey for a backpacker but in exchange for your entry fee (or donation), you get an incredible experience with the elephants that you will never forget. We had the opportunity to learn about the elephants, how they have been rehabilitated and how they can now live free in the jungle, without being harmed. As a visitor, and with the guidance of the guides (who used to be mahouts), you can feed the elephants bananas and cucumbers, then follow the elephants into the jungle to watch them eat in their natural habitat. You later join in to help bathe them in a muddy pool, and then wash the mud off in a river, all in the middle of a beautiful jungle forest. It is absolutely incredible to get up close to these gigantic and smart creatures. You of course have to follow your guide’s instructions at all times to avoid accidents. Keep in mind that even though these elephants were trained once upon a time to obey humans, they are still wild animals. In this place they quickly learn again to decide for themselves and be free again. I asked the guides how they get the elephants to stay with the group and not attack any of us and they explained that they encourage them along by giving them food. This is certainly better than using the hook to the ear! Thanks to the visitors’s donations and other funding the center is able to care for these elephants and continue to rescue others. They also educate the local Karen people about these animals and get them involved in the rescue operations and turn mahouts into guides at the reserve. It was a wonderful experience that I will cherish forever and that I recommend to anyone who comes to Thailand. the mahouts would ask the elephants to kiss us and they did… right on the neck. we are able to interact a bit with the elephants (cautiously) as long as the mahouts keep feeding them cucumbers, bananas and sugar cane. This is much better than using a hook! I enjoyed three beautiful days in the island of Koh Tao. I tried four “fun” dives with a really awesome group of instructors from Pura Vida. This is a really cool dive business with excellent reviews on Trip Advisor, managed mostly by Spanish people. I had two great experiences diving with them. The first one was diving down to a WWII ship wreck and actually standing inside it. It was my first time going to a depth of 23m. The other memorable experience was being attacked by a trigger fish. I just stuck to my my guide Ray’s instructions that he had given during our pre-dive talk. He warned me that there were trigger fish in the area and that if we happened to be directly above them, they may strike. We were carefully watching the fish during our descent to avoid being above them, but it still happened. As soon as we got to our desired depth, we began to swim in one direction. We spotted a trigger fish and swam away in the opposite direction. We thought we were safe and away but about a minute later, I felt a rather strong tug on one of my fins, I turned around and I saw it! I immediately reached out to Ray and we got together and extended our legs out in front of us, and against the fish. We wanted it to bite our fins instead of trying to come at our faces. It was a bit challenging trying to escape this fish as it did not want to give up. After a few minutes it finally got tired and swam away. I was very happy to have survived my first experience with a hostile fish! Unfortunately I did not take my GoPro so I have no pictures of the fun. As much as I was tempted to stay in Koh Tao and get my advanced diver license, I had to move on to Koh Phangan to experience the famous Full Moon Party. I was invited by a couple of Chilean girls that I met on my dive boat, Margarita and Lorena, to stay with them in their bungalow. I definitely wanted to take advantage of the opportunity to experience this crazy party in good company. We arrived the night before the actual full moon but the festivities had already started with a few parties on and around the beach. The famous fire rope that drunk people try to jump as long as they can or until it burns out (or until someone gets burned). Haad Rin beach covered with people. Each bar sold food, liquor/mix buckets and played music. It was a once in a lifetime experience that I will never forget. I partied like it was 1999 and I was 23 all over again! It was awesome but the hang-over the next day nearly killed me! Next on the list of islands was Koh Samui, finally for some real rest and relaxation. It is a much bigger and touristic island than the previous two. I stayed in Lamai; a wide and long white sand beach with a lot of water sports and restaurants. You can find some nice, clean and very affordable accommodation right next to the beach, for example, at Rich Resort. When I got bored of laying around I decided to join a trip to Mu Ko An Thong Marine National Park; which was absolutely spectacular. We did a little bit of kayaking around the beautiful limestone caves and hiked up to a view point on one of the islands to get an amazing view of some of the other 42 islands that make up this park. My next stop was Krabi, on the mainland; which is where you can catch ferries to islands on the Andaman Sea on the West side. I met Margarita and Lorena there again and enjoyed a nice day on the beach in Ao Nang. I only stayed a day here as I wanted to move on to more islands. floating pier; which moved up and down with the waves. My next stop was Koh Phi Phi where I only wanted to spend a couple of days. I happened to arrive to my hostel in Koh Phi Phi and find Andreas sitting in the reception area. I had previously met Andreas on the speed boat cruise to An Thong Marine Park. It turns out that the hostel was all booked and they had no bed for me even though I had booked a room in advance. I asked Andreas to join me on a hike to see the sunset from one of the island’s viewpoints but I first had to find another room. So after I struggled to find cheap and clean accommodation, I decided to go for a US$25 room; which is the most expensive room I have gotten in my year of travel! You can find cheaper rooms on the island but they usually come with a few roaches and even rats. This island is definitely more expensive than some of the others and your money does not go very far. The room was very basic, with only the bed and a small bathroom but it worked well. Thankfully Andreas moved in the next day so we could split costs. We continued to explore the island on foot (vs. renting a boat like other people do). Little did we know that the day would just continue to get better and better. We left the secret beach to walk to the furthest beach to the north of the island, Lana Beach. We walked up and down the hills and some jungle to reach it. It turned out to be a nice long white-sand beach with shallow, clean waters and a ton of fish. We swam with an enormous school of fish that stuck around us for a long time, right by the shore. We were having such a great time that I completely forgot to take pictures! For sure it could not get better than this but we decided to keep exploring to see what else we could find. According to our map there was another small beach just left of Lana beach but on the opposite side of the bay. It seemed we could only get there by climbing over a small hill through more jungle. We decided to check it out for sunset before returning back to Tonsai Bay (where our hotel was). We did a little bit of rock scrambling, went past a fishermen’s village and up a hill, through some dense jungle, and down some slippery sandy trails with the help of a fixed rope and… we found it! The most spectacular and pristine beach that we’d ever seen. We came out from the forest into a fine white powdery sand beach with amazing limestone towers all around coming out of the perfect turquoise waters. We only found two other couples there and a guy that offered us a ride back to Tonsai on his boat. At first we said yes but after seeing how spectacular this place was, we decided to stay longer and hike back through the jungle at night for a little more adventure. our view coming through the jungle and discovering the beach… the picture does not do it justice at all, it’s a bit dark but trust me, it was beautiful! We immediately thought about spending the night on the beach but we decided not to stay as we had no food or enough water with us. We made a plan to come back the following day with the necessary supplies to camp overnight. The next day we gathered some basic provisions and bought a beach mat to sleep on. We would take our chances with the elements as we could not find a tent on the island (it is prohibited to camp on the beaches). On our way there we stopped at this cool little reggae bar where they had us sign a guestbook. We drew a picture of this incredible beach so that others can try to find it… we did not leave a map though, they have to work for it! This was the first time ever that I swam in the ocean at night… we even went skinny dipping and we swam with some bioluminescent plankton. It was absolutely magical to be able to spend the night under the stars, being put to sleep by the sound of the crashing waves, and with a jungle right behind us! It was a very awesome experience. We were woken up by a few rain drops that turned into a torrential downpour in the middle of the night but luckily we found cover in a nearby cave where we took shelter for a while. As soon as the rain stopped we went back out on the sand and set up our stuff again to sleep the rest of the night. I mean, look at the color of this water! Koh Phi Phi was paradise to us. As touristy as it is, we managed to get off the beaten path and find amazing trails and beaches that not a lot of people seem to know about. I will never forget this place and Andreas, my partner in crime exploring this magnificent place! And yet another spectacular Marine Park, the protected Ao Phang Nga National Park full of limestone cliffs, caves and sheer limestone karsts popping out of the green emerald waters everywhere you look. 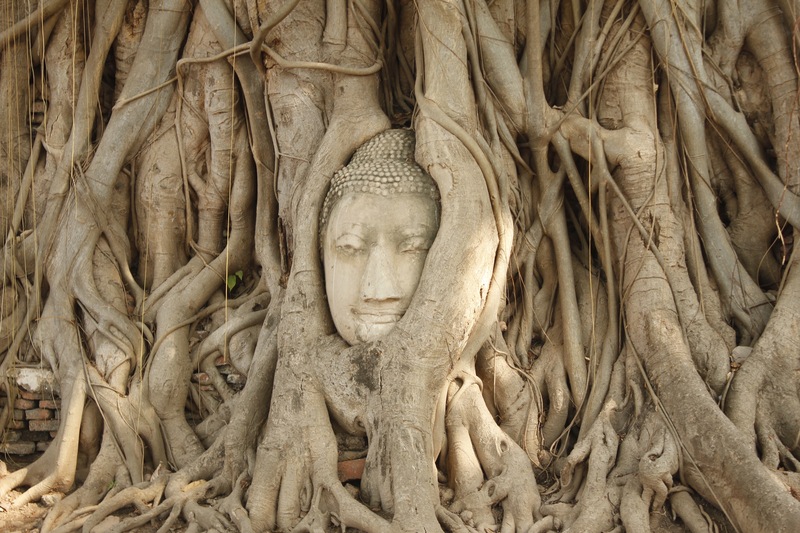 After a sad goodbye to Andreas and the islands, I headed back to Bangkok for three days. The main goal was to get my visa for Myanmar. I did not do a lot of sight-seeing here as I will be back in about two months with my friend Thanh from LA who is meeting me to travel for a few days before she heads to Japan and I head to Cambodia. I did do a couple of day trips to get my Sak Yant tattoo to Nakhon Chai Si District, in Nakhon Pathom (see previous post). 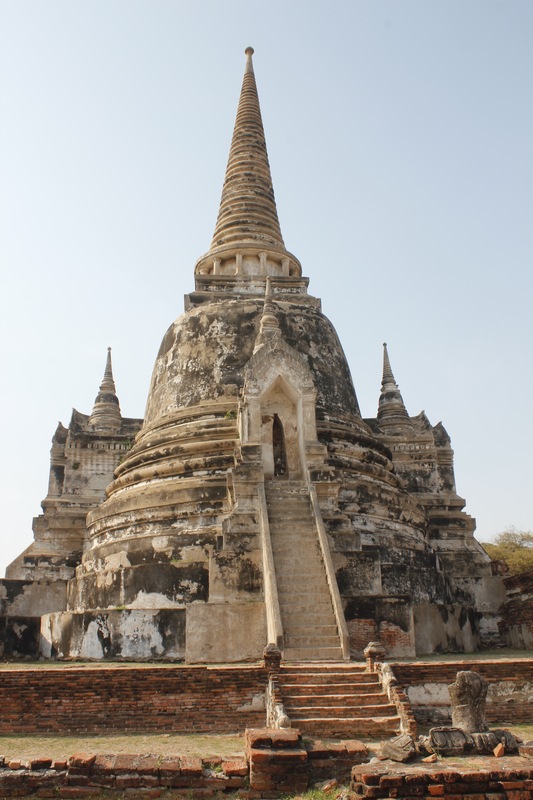 I also visited the ancient city of Ayuthaya, located about 80km from Bangkok to the north. 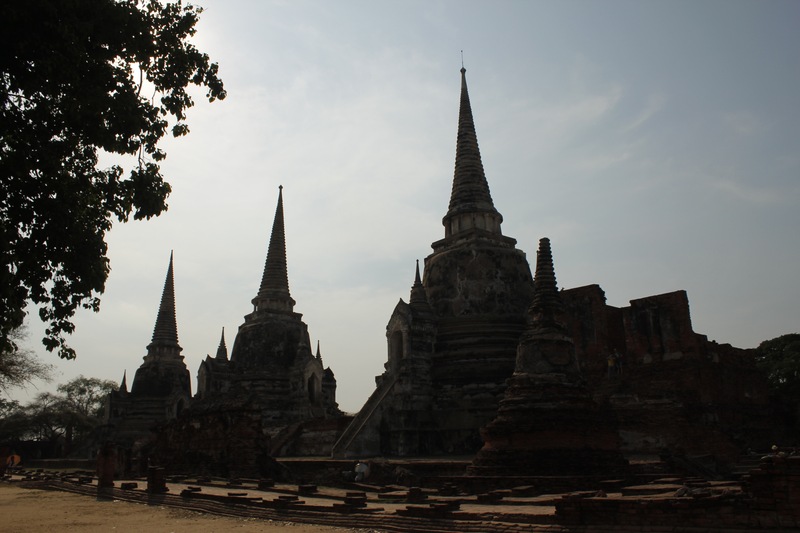 This was the capital of the Kingdom of Siam from 1350 to 1767. 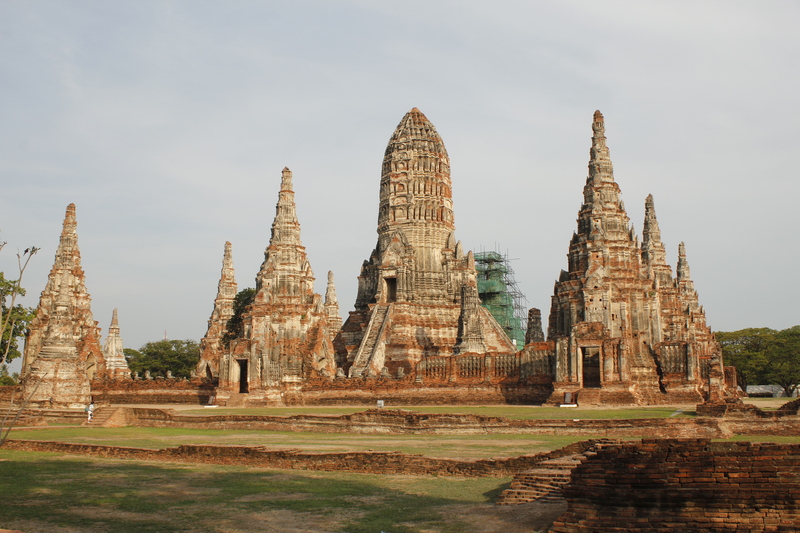 There are beautiful ruins of Buddhist temples, monasteries, palaces and statues; which are now part of the Ayuthaya Historical Park, an important archaeological site. Ahhhhhh Thailand! Just incredible! There is a reason why this place is so full of tourists… because it is absolutely spectacular and fun! I highly recommend going there, if it is one of the only places you visit in your lifetime.